This blog is the work of many wonderful community members taking detailed notes at the hearings – followed by careful editing and verification before posting. Thanks for reading the blog and taking an interest in the scrutiny of the biggest infrastructure project proposed by the Victorian and federal governments. For the second day in a row the committee ran out of time. Mr Wyatt’s evidence on urban design has been held over to Day 5 and Ms Nesbitt’s on social impacts to Day 8. With three other witnesses already listed for Day 5 are we rapidly heading to witness-gridlock? The Act gives no leeway for extended time restricting the hearing to 30 days. Engineer, Tom Brock, was grilled this afternoon about his expert witness report. He does not rule out any alternatives for the Royal Park section and people should not feel constrained by the blue lines. When questioned by Wren, Tom Brock of GHD stated his report was initially done for LMA but was now in the public domain. Brock said GHD was not part of the reference design process. This was done by a consortium appointed by LMA. It appears some of those involved in the reference design may now be involved with bidders. In response to a question about visual impacts, Brock says “beauty is in the eye of the most senior beholder”. Pelosi made this comment while being interrogated about his role in analyzing the traffic figures. At different points in his cross-examination, Wren has questioned whether views of experts are expressed as experts or individuals. As an expert witness in traffic, Pelosi appeared to accept the outputs of the Veitch model and the GHD micro-simulation, and confirmed he did not seek any further raw data, or information about intersections. Mr Pelosi told us that he had read over 1000 submissions over summer. He was grilled for the whole morning, but there was no illumination as to why he had supported everything in the CIS. He assured us he could find nothing in the 1,030 submissions that convinced him of fault in the CIS. On peak and off-peak periods and capacity and again it was noted that the main benefits for EWL are outside peak time. Citylink also (already) has spare capacity outside of the peak. The Ormond Road off-ramp – said to be designed to address difficulties for traffic exiting the tunnel at Elliot Avenue, heading towards Mount Alexander Road. Pelosi said the CIS does not detail the appropriateness of the Ormond Road off-ramp (that is, it cannot be deduced from the GHD micro-simulation). Pelosi received this information from LMA and GHD. The committee asked for clarification of VicRoads figures. 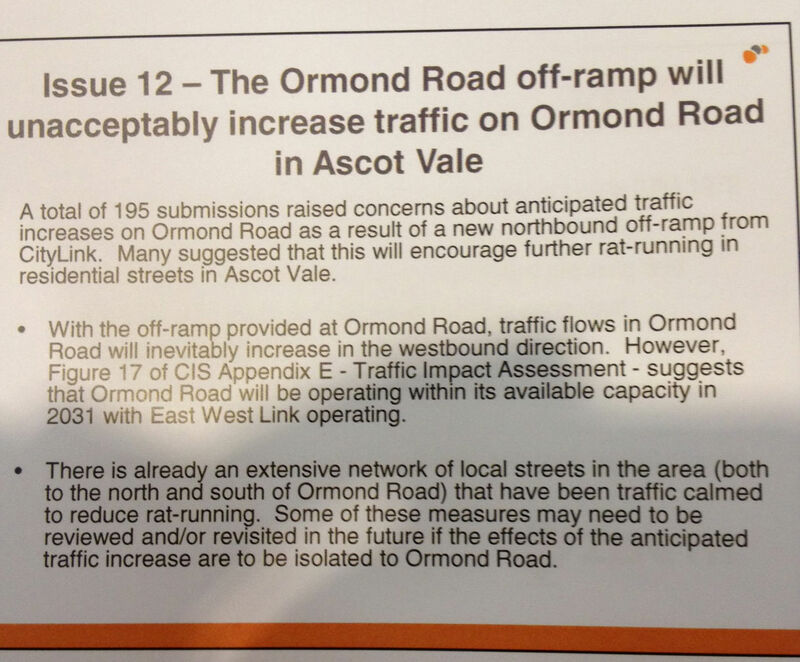 Pelosi comments about capacity on Ormond Road do not deal with the specific operation or capacity of Mount Alexander Road / Ormond Road intersection. Just on Ormond Rd – here is a slide from Veitch’s presentation yesterday. In his cross-examination of Pelosi, Mr Wren QC, counsel for the assessment committee, again queried traffic flows east of Hoddle St. He asked Pelosi whether it struck him as unusual that the project does not address traffic east to southbound onto Hoddle street. Yesterday, Wren asked Michael Veitch about the congestion that would result on roads leading to the eastern freeway at Yarra bend musing that if the freeway is a “drain”, it may be clogged at that point. Pelosi said nothing will improve traffic in Hoddle St. “Hoddle Street [will be] operating at a similar level of performance” – or with a 10% increase south of the eastern freeway as we heard yesterday from Veitch. Again, it was confirmed that any benefits of reduced traffic in Alexandra Pde would evaporate by 2031. And talking freight, Pelosi said he expected seven percent of traffic would be heavy vehicle, generally consistent with other freeways and arterial roads. 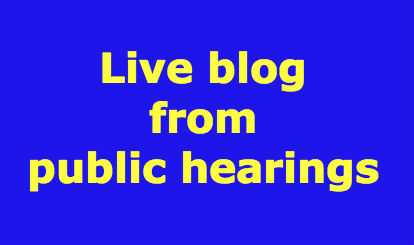 Petra Stock, Andrew Herington and others are at the hearings today and we look forward to their updates and insights on the blog. Mr Pelosi is providing expert evidence. See his report here. Yarra had argued Pelosi should not take the expert witness stand as his statement does not meet the requirements of expert evidence and does not disclose the process of reasoning behind the conclusions drawn. Yesterday, the committee ruled the evidence of Pelosi can be heard and that it is open to Yarra, through Counsel Adrian Finanzio, and others to draw to the committee’s attention any perceived inadequacies of Pelosi’s report. Wren QC questioned Pelosi on the nature of the peer review he undertook: Does peer reviewer need to be robust and with a cynical eye and test underlying assumptions? Yes, yes, yes. But Pelosi confirmed that no data was remodelled as part of the peer review. Has any consideration been given to extended hearing hours to ensure all the witnesses and submitters are heard? What are the current hours – 10am – 4:30pm? Good point. The days do run later than 4:30 to make sure submissions are heard. The approach from the panel so far has been very reasonable regarding timing. We will know more when the individual presentations begin and if time is being lost each day. Thank you Andrew for providing fantastic coverage of the hearings. There are so many issues related to this potential project that I feel the public has been kept in the dark over. Your blog provides us with much needed accurate and non political information.